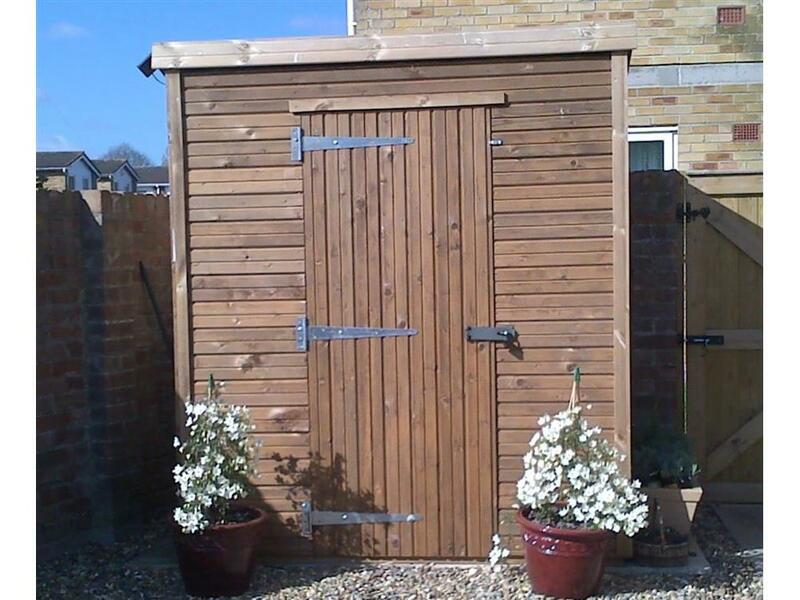 Heavy Duty Garden Sheds can add beauty to your garden while giving you storage space. Having secure garden sheds is important so that your expensive gardening and lawn care equipment is kept safe from thieves and the elements. Every single piece of wood is Tanalised, the framework is made from robust 3" x 2" planed timber and (25mm planed to 20mm finish) tongue and groove wood as the cladding. These sheds are known as the 'Bomb Shelters' - they are extremely strong and well protected from the elements! We use the best materials available to be sure the Beast sheds will satisfy the most discerning DIY enthusiast! Don't forget, you can change any part of your shed, we've just started you off with the typical Beast Shed set-up! Wanted a strong multi purpose shed so I went for a 12x10 beast shed and I could not be happier. Excellent materials should last me years. Strong, sturdy, and looks great. Very happy very polite and tidy fitters. superb shed worth every penny. Very good shed. Solid and dry. Nice colour, too. Assembled quickly. Delivered on time. Company easy to work with. Even our neigbour loves it! That there were no options for felt tiles or rubber tiles for the roof covering. 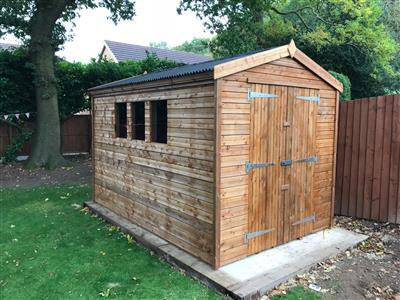 We reviewed a number of shed options at other sites. The Beast Shed came up as the best value for money for a robust, good quality shed, and we were able to choose a custom size and height to fit our garden perfectly. The ordering process was straightforward and efficient. I was given a clear delivery date in 2 weeks time. I was given a confirmation call to check everything was in order. The shed was delivered on time, assembled efficiently in the correct place. I was given a chance to review the shed to check there were no issues with it prior to confirming I was happy to finalise paying. 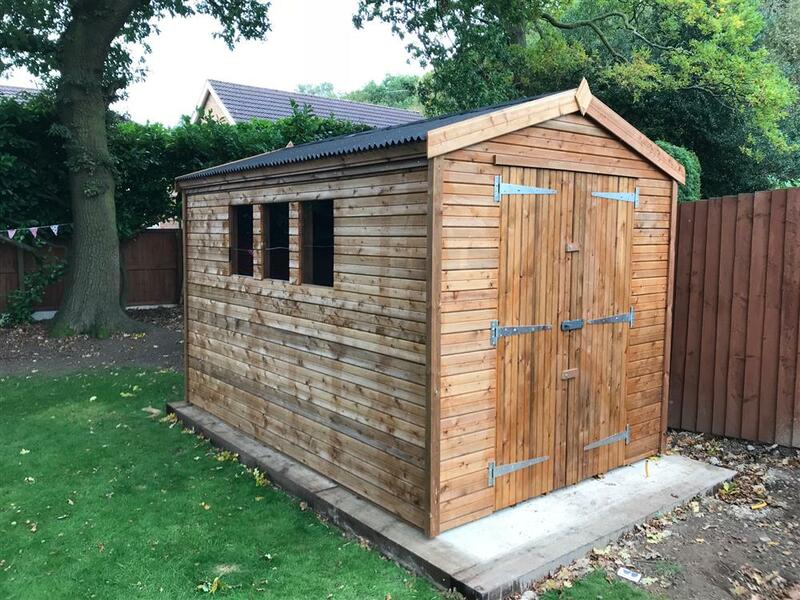 The shed was exactly as specified on the website, and of excellent quality. I was given appropriate aftercare instructions. Speed of delivery, the included construction at home, door security. My garage was a general dumping ground. So what was the answer? I considered a garden shed, but I wanted something which was substantial, and solidly built. I visited a number of dealers and was surprised that even a flimsy shed was fairly expensive. I wanted a substantial shed with solid walls and roof. One which didn?t need to have the timber treated within a few weeks of being erected in my garden. I searched the internet and found Beast Sheds. These sheds are not especially cheap, but I have concluded that you get what you pay for. I completed the online order form. 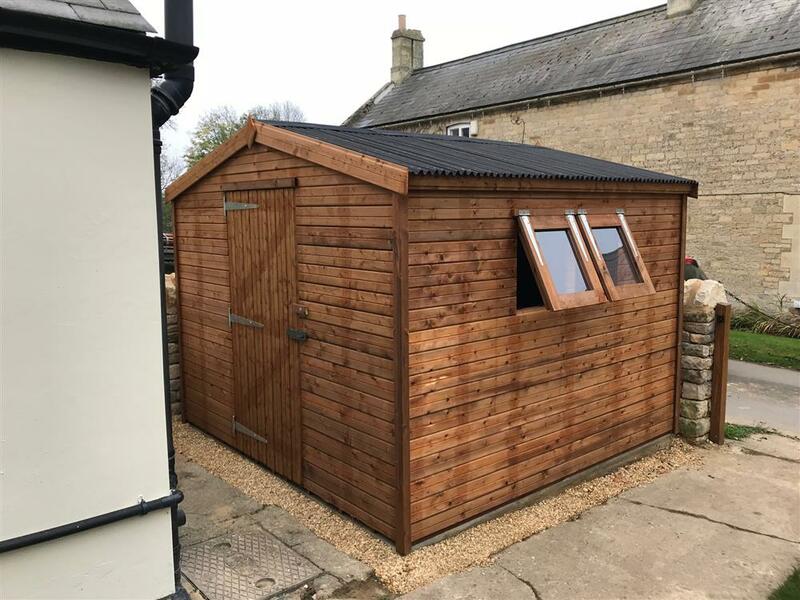 This allows you to design a shed to your own preferences. Approximately 2 weeks later, I got a message stating the beast shed was ready to be delivered. The shed was quickly erected with screwed together sections. When I viewed the sheds on other web sites and compared them to yours there didn't seem much choice, either put up with thin ill made sheds that would need attention in a few years time or buy the best on the market, ( no brainer really ) It was easy to order with lots of shed sizes to choice from, and how many doors ,windows and even what kind of locks you wanted. The delivery men were on time and nothing was too much trouble for them! 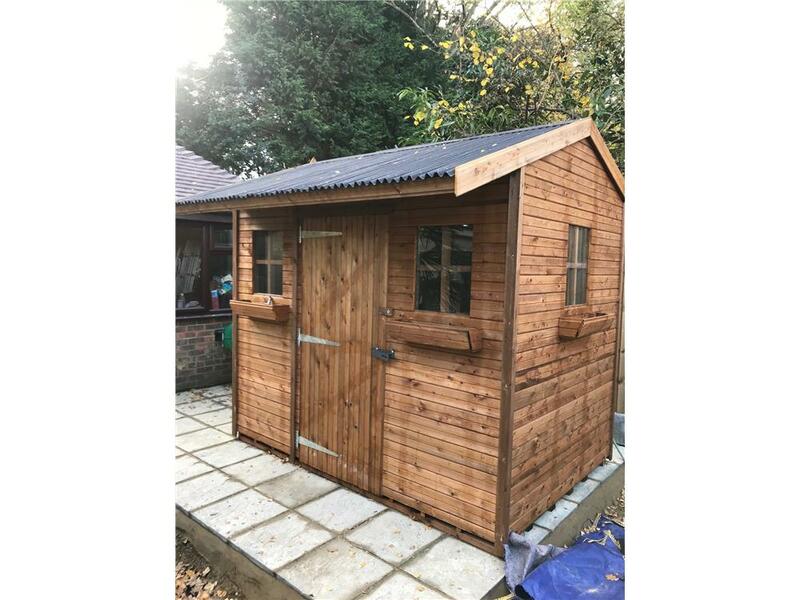 I must admit that this shed has surprised me by the thickness of the wood and the professional way it is made, and expect it to be standing for many a year to come. Everything has been very well made and will compliment my beautiful new lawn. Cant find any faults as yet, but still looking??? 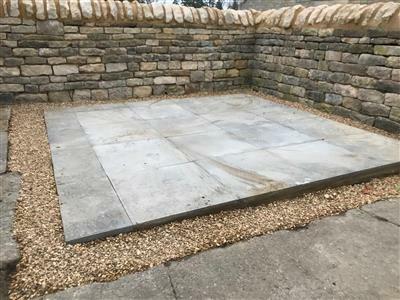 I bought a 8 x 6 Beast Shed last year to replace a rotten 6 x 6, I chose the beast shed as 2 sides are inaccessible after erection and wanted the peace of mind that a fully tanalised shed would give me. I have been very happy with my purchase which was extremely easy through the beast shed website, and the correspondence i had with the company was very satisfactory, the shed was delivered and put up on the day that was promised and is very well made and i've had no issues at all with it since it was installed. I would recommend purchasing a shed from this company as they have been nothing but helpful since i placed the order. Quality shed. Great service! Recommended. The shed was delivered and erected on the date advised. Fortunately it was a dry day, and the expert fitting team of 1, did a magnificent job. the Shed was fully erected in 1 hour, including a shelf, windows and fittings. Since then it hasn't stopped raining, and despite the poisition of the shed, in a very damp part of the garden, I am pleased to say, the inside has been as dry as a bone. I am very pleased with this shed. Top quality build and service delivered as promised. The two guys who came to build it were great and offered advice on insulating it. Only thing I would have liked is to have better roof felt or tiles offered as an extra option. The shed is very sturdy, and excellent value. I thoroughly recommend. My hubby loves our shed so much he's taken it over! I'm going to have to buy another for myself! I'd say you're better off buying as big a shed as you can fit in your garden! Thanks for a fantastic service and a great shed! Been a real pleasure from start to finish! 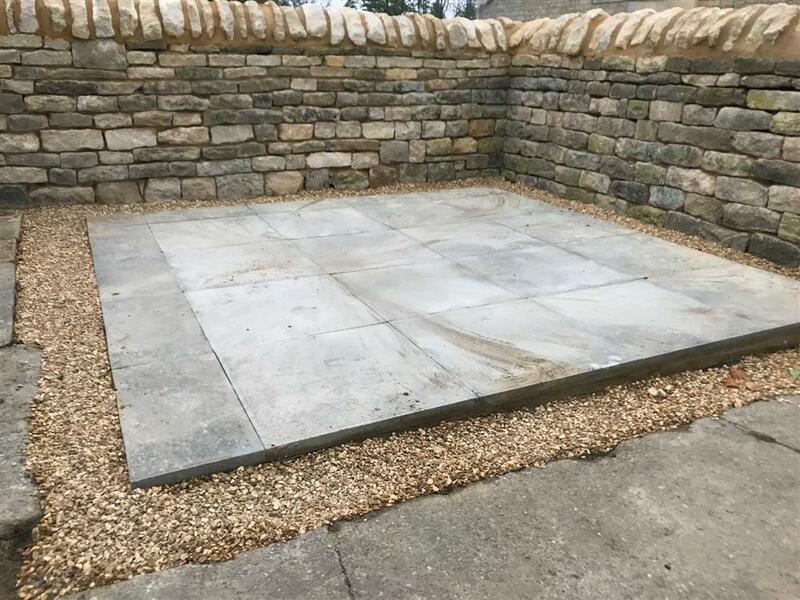 We bought a shed from Easy Shed's website (www.easyshed.co.uk) and found the whole process really EASY! I could adjust the shed's layout, windows and doors, to match exactly what I had in mind. I was happily surprised to see they offered a Cash on Delivery option - you don't see many online companies offereing this, its usually payment up front nowadays! I need not have worried though, the delivery was first thing in the morning, and 2 cups of tea later the boys had put up my brand new shed! I did a bit of "tire kicking" to test the sheds strength and as they stated, it really is a solid structure! Thanks Easy Shed! 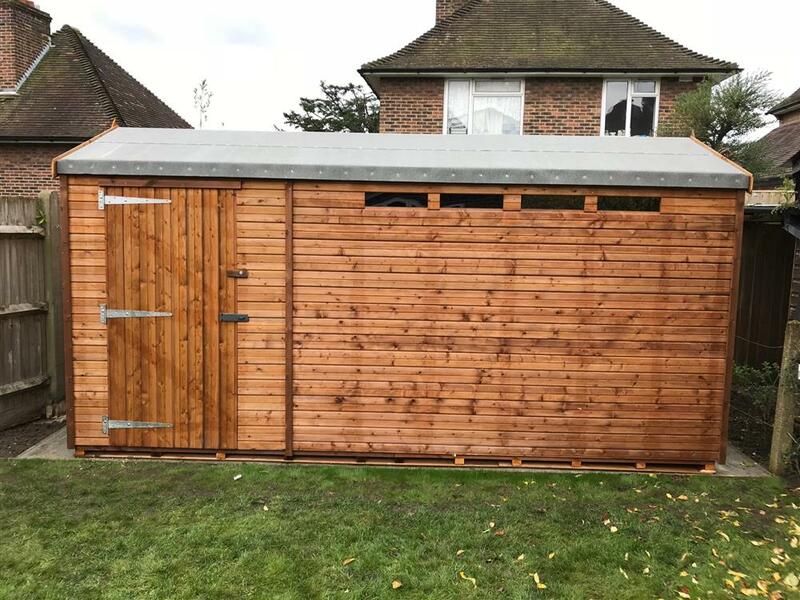 I needed a strong and secure shed to store my motorbike and tools - and this is the perfect job! No cheap locks or bolts that you get from other shed companies, you would need a bulldozer to break into this! 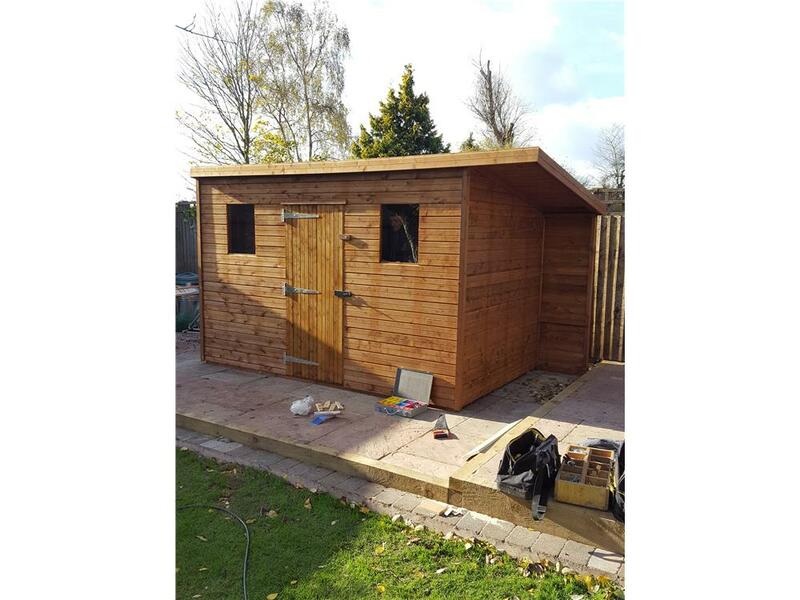 excellent quality shed, delivered and assembled, best price on the internet. 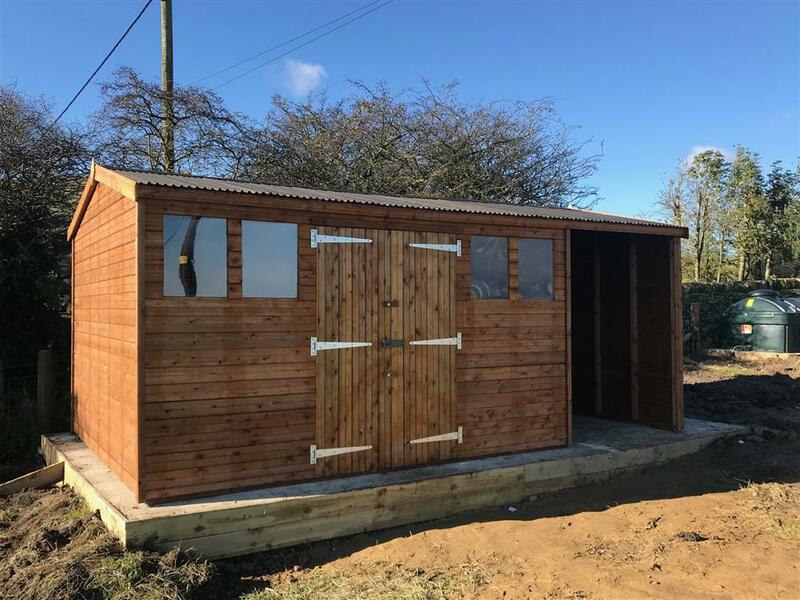 Fast service - good communication - top quality shed. I love my Elite shed! As I use my shed every day for work, it's worth paying a few quid more to get a shed that'll last and definately keep my tools safe! Item as described, free installation, very good product and service. Really great shed, highly recommend this company! Thanks. FANTASTIC ! - Quality - Value - Erection - Comm's - YOU WILL GET NO BETTER! Brilliant! Shed is so much better than any cheap alternative! Highly recommended! Great value for money. Very quick service. Delighted with shed which was very well put up. Would definitely use again. Showing the way we bolt the hinges & lock on for our Beast range of sheds. Please note, this is an ex-demo shed, so it may not be in the best condition! 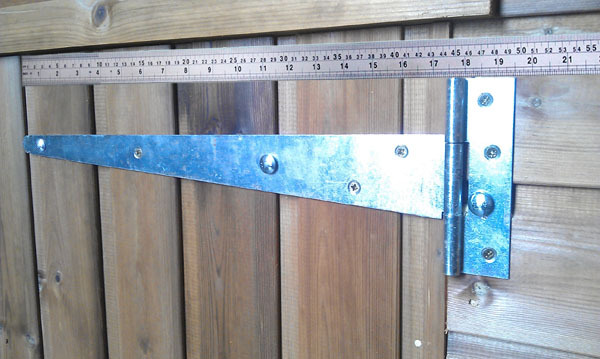 The Hasp & Staple lock - comes as standard with the Beast range of sheds. You can see from the picture just how heavy duty it is & how it is securely bolted & screwed to the shed through the cladding & framework. Once the hasp is closed all the screws & bolts are concealed. The hinges are bolted through the framework. So even if someone unscrewed the screws, they would still not be able to get the hinge off.